avios.com has sent me details of their latest special offers for booking hotel rooms via their hotel booking portal. Hilton Heathrow T5 (which is not actually in the airport) is included. A 3-night stay from 20th May is £309 at the Hilton HHonors member rate. Via avios.com it is £230 + 2,100 Avios which works out at almost 4p per point. At the luxury end, the Rocco Forte Hotel de Russie in Rome is £2,450 for the same three nights in a classic room. Via avios.com it is 15,750 Avios + £1,495 which gets you 6p per point. If you choose to pay entirely in Avios, however, the value drops back to 0.78p! Similar deals are available at the Excelsior in Hong Kong, Blue Waters in Antigua, Turim in Lisbon and the Hilton at Madrid Airport. It is not clear when these deals end but they were still active last night. Hot on the heels of the Marriott Rewards changes, Starwood Preferred Guest has announced its annual list of recategorisations. You can see the list here. The list of increases and decreases is roughly 60 / 40. The biggest shock will be at the 30+ hotels moving from Category 5 (12,000 – 16,000 points per night) to Category 6 (20,000 – 25,000 points per night). That is a big jump. It was interesting to see the fantastic St Regis in Istanbul, where I was last week (review to follow), dropping to Category 6. 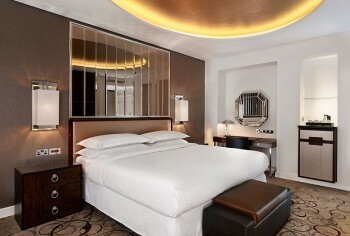 With room rates in Istanbul at record lows at the moment, however, a redemption will still not be great value. Rooms were selling for €260 when I was there compared with 30,000 points. I would usually expect more than double the value for an SPG redemption. In the UK, The Park Lane Hotel in London jumps from Category 5 to 6. This hotel is currently coming to the end of a massive refurbishment so the increase may be justified – see the new room photo above. The Great Northern Hotel at Kings Cross is also increasing to Category 6 just a few months after joining SPG. Meanwhile, the Hotel Kämp in Helsinki is leaving Starwood on 29th February. I only stayed there once, in pre-HFP days, but I remember being hugely impressed by it. It is reportedly joining the ‘Leading Hotels of the World’ marketing group. OT but does anyone know if my Accor Platinum that I have due to AMEX Platinum which expires 09/16 be extended to 04/17 which is 12 months from when AMEX are withdrawing the benefit? Unlikely but we can’t be sure.